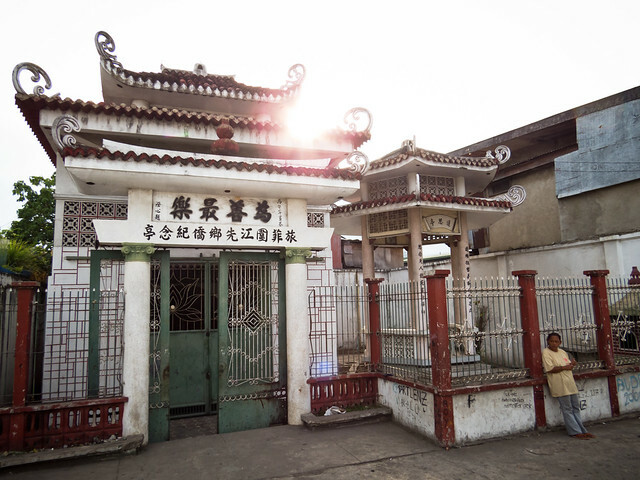 With a long history of conquest and settlement by the Chinese, Arabs, Spanish, Japanese, Americans, and various indigenous tribes (to name just a few), the architecture, cuisine and general culture of the Philippines is greatly reflected in its extremely mixed heritage. Even the facial characteristics of the Filipino people seem to vary much more greatly than in any other Asian country we’ve visited. 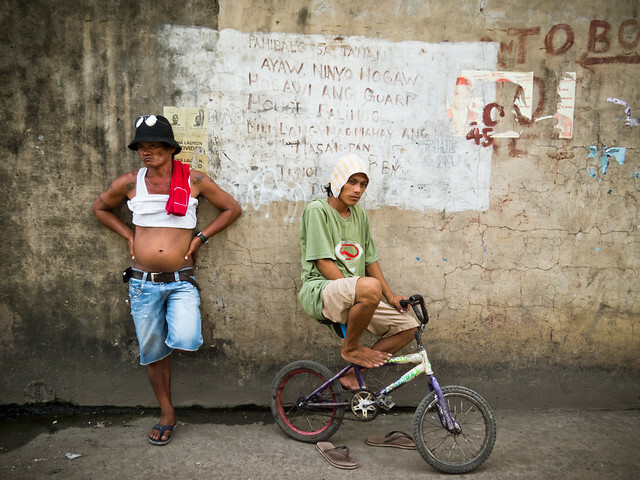 Walking through downtown Manila one really gets a glimpse of this collision of cultures. 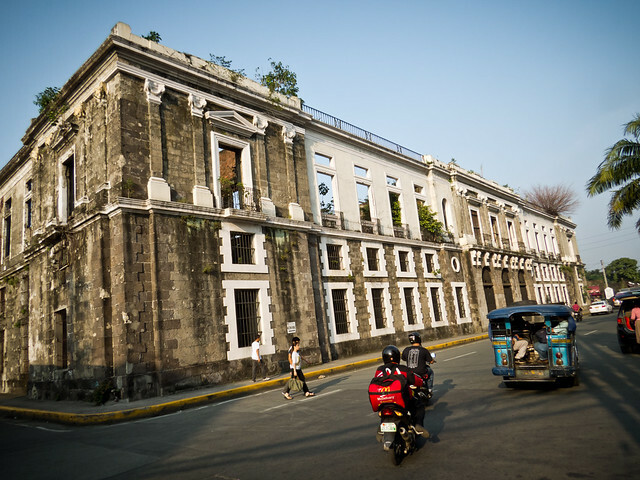 Intramuros, for example, the walled colonial core of the city with its churches, plazas and gorgeous Fort Santiago, is located directly across the river from Binondo, the world’s oldest Chinatown. 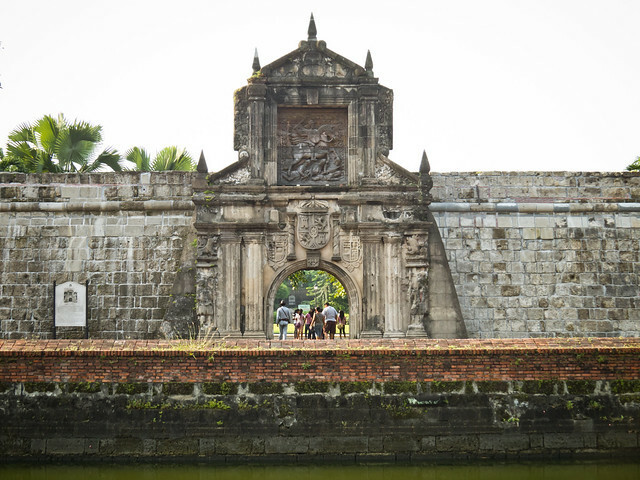 Reminding us a lot of other walled, colonial centers that we’ve visited on our trip (such as Casco Viejo in Panama City, Panama), Intramuros has partially been meticulously cared for while partially having also been left in total disrepair to be taken over by squatters. The two versions side-by-side is yet another study in Filipino contrasts and creates pretty incredible photographic opportunities. 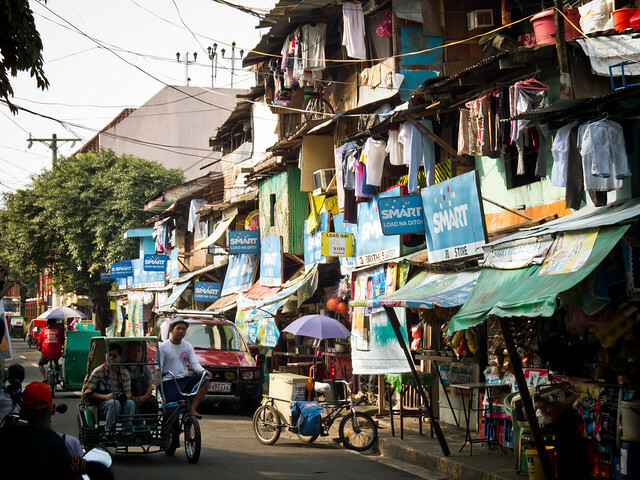 As the #1 most densely populated city in the world in the 12th most populated country, Manila was a shock to every one of our senses. 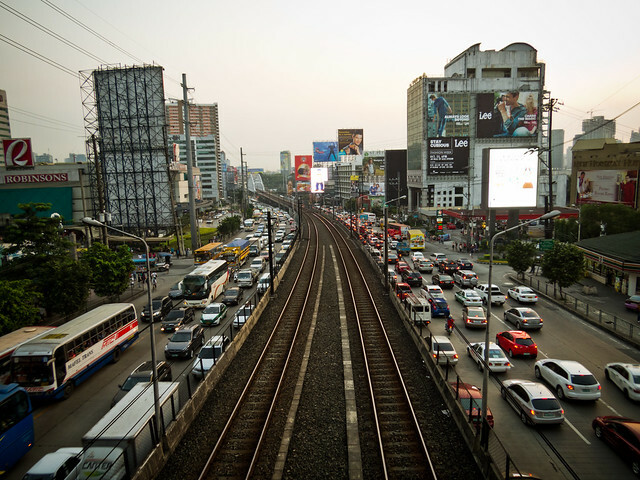 Swarms of people surrounded us no matter the location: bodies pressed against bodies in buses, trains and jeepneys, cars sat in traffic for hours, and pedestrians haphazardly ran across streets in front of vehicles. 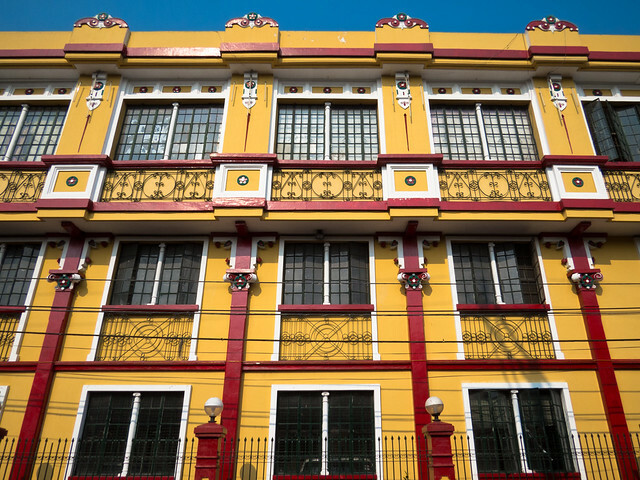 The population density permeates the air of Manila so intensely that during our few days in Manila we only ventured outside of our walking distance radius once, prefering to spend most of our time exploring our neighborhood of Mandaluyong City. So, when a local friend proposed a trip a few hours south to Tagaytay City and Taal Lake we jumped at the opportunity to escape the congested capital city. 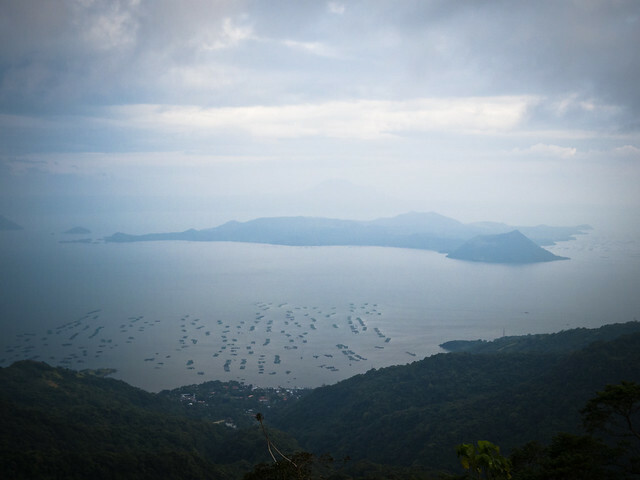 Once lakeside we spied Taal Volcano, the main attraction of the day, through an overcast sky. The volcano is the second most active in the Philippines and, even more interesting, the volcano to house the world’s largest lake on an island (Volcano Island), in a lake (Taal Lake) on an island (Luzon). Did you get that?! 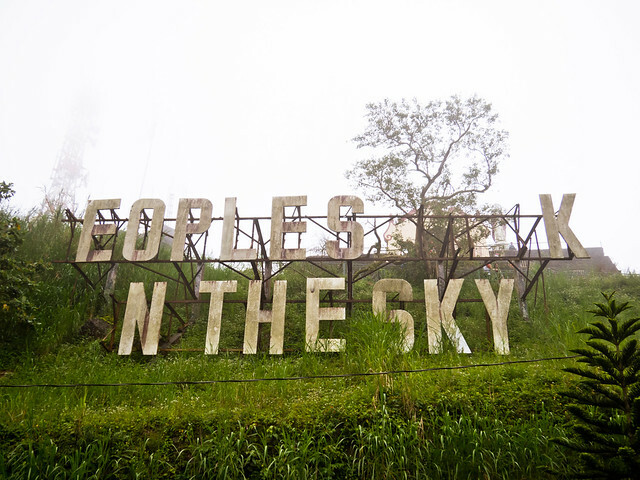 We also visited the People’s Park in the Sky, an interesting park atop a mountain in an incongruous state of half complete abandon and half careful maintenance. Yes, the Philippines is pretty consistent in its ways! After several days of sightseeing, eating and a bit of shopping in Manila, we headed back to the airport to board a flight to Cebu, where we would catch a bus to Malapascua- the second island destination of our trip. Though our only real goal was to go diving with thresher sharks in their natural environment, we got a lot more than we bargained for: enormous sea snakes, colorful sea stars, mating mandarin fish, nudibranches of every color and size, pipefish, schools of cuttlefish, sea cucumbers, and the most variety of beautiful coral that we’ve ever seen. The country’s reputation as one of the world’s most biodiverse is easily verified underwater around Malapascua. And as for the threshers, they were magnificent. We departed an hour before sunrise on two different mornings to witness the sharks swimming circles around a cleaning station. With each rotation they appeared to head directly towards us and at the last moment dart to the side. The more we dive around sharks the less we fear them, however we have an ever increasing amount of awe and respect for these majestic creatures. 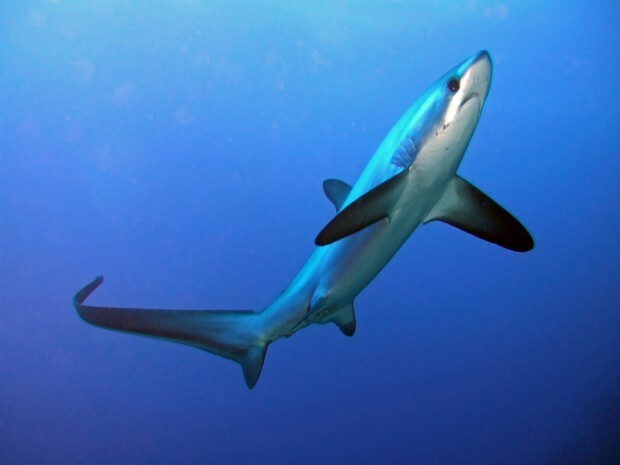 We definitely look forward to diving with more varieties of sharks in the future. 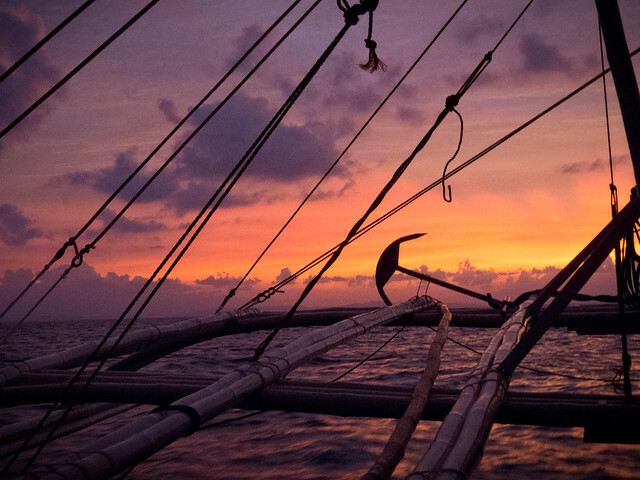 Though the diving was the highlight, we were able to capture some topside shots of our early morning sunrises as well as some of the relaxed life of the tiny island of Malapascua. After visiting Malapascua we ventured back across the bay to Cebu with one goal for the night: to eat at Zubuchon, home of what celebrity chef Anthony Bourdain claimed to be the “Best Pig… EVER!” in an episode of his travel show “No Reservations.” While lechón (roasted pork) is served all across the country (as well as in Spain and many countries with a history of Spanish colonization), it definitely was superbly made at this particular restaurant. The meat: tender and juicy. 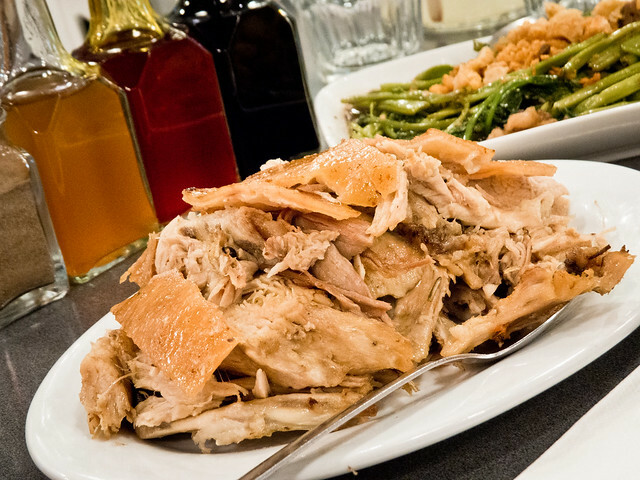 The sides: fantastically prepared. The décor: simple, modern and crisp. 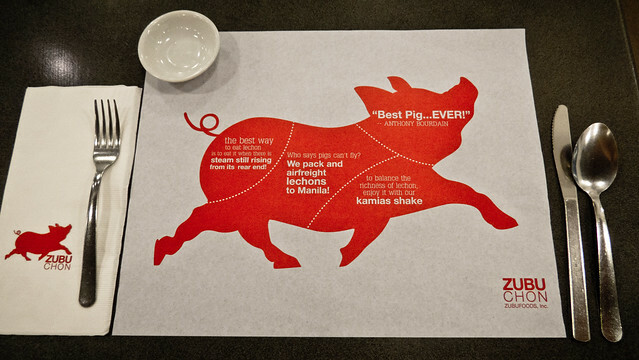 In our opinion a night spent in Cebu is definitely worth it if only for dinner at Zubuchon. 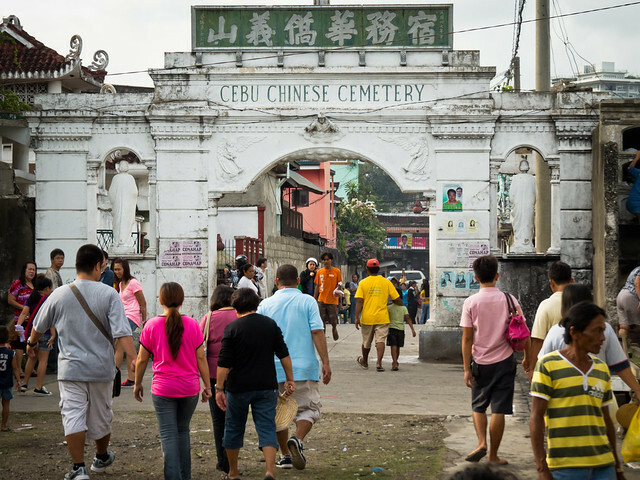 Fortunately for us, All Saints’ Day was being celebrated directly across the street from our hotel at the Cebu Chinese Cemetery the night of our visit. Here, the dead were definitely being remembered in style: graves were decorated with beautiful flowers and enormous candles, vendors sold street food of every type, and music was being played from many of the monuments. Again, the photographic opportunities were limitless as cultures collided and town characters come out for the annual celebration remembering those who’d passed. From Cebu City we took a ferry to Tagbilaran City in Bohol, our fourth island destination. 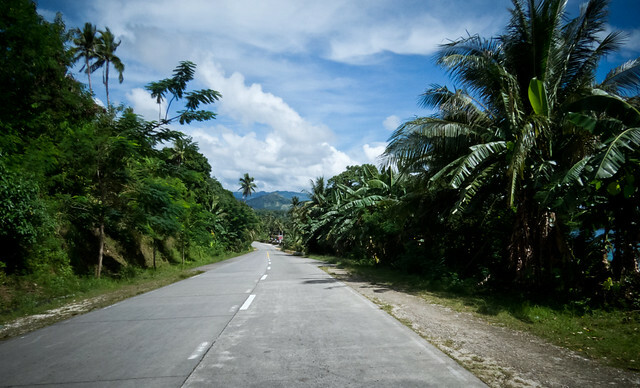 Immediately we rented a small motorcycle and hit the roads in search of the Philippine Tarsier Foundation. For months we had been talking about these little primates (the smallest in the world! 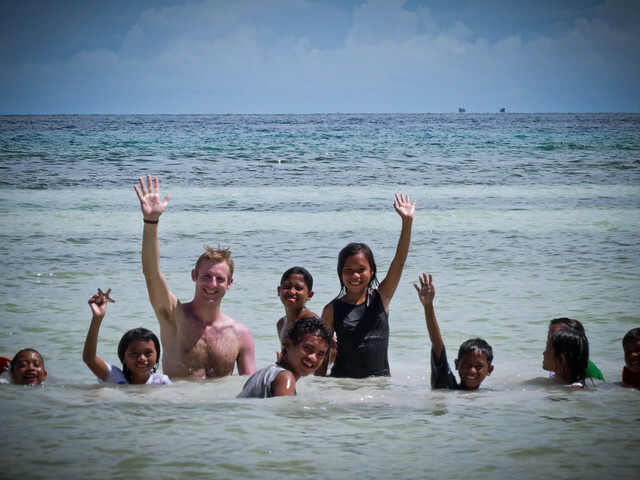 ), our excitement building every step of the way as we neared their safe haven just outside of Tagbilaran. Fortunately, due to the intermittent rain storms we’d been skirting around on our way to the sanctuary we were all alone during our visit. 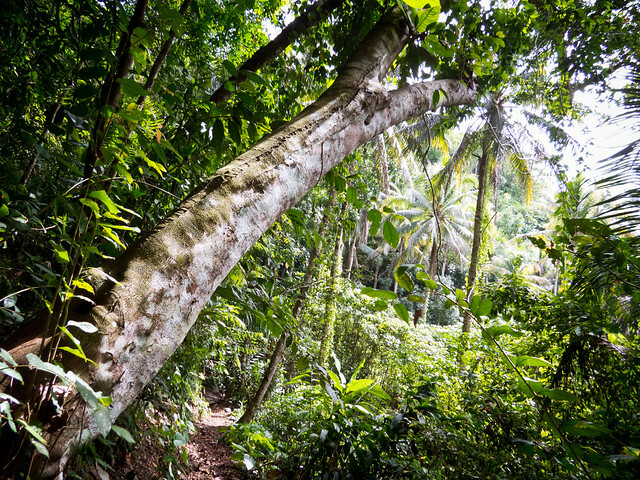 We walked around both the protected sanctuary and the surrounding jungle, hunting for tarsiers and spying on other native creatures. We were able to spot a handful of these little mammals who are at the same time incredibly adorable and unmistakably alien looking. 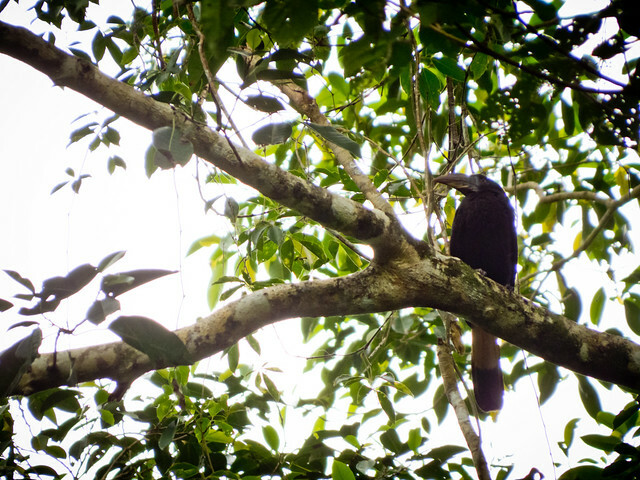 Docile at day, they mostly clung to their low branches half-staring at us and half-dozing their time away. But don’t let them fool you; at night, with no visitors allowed, these cute critters turn into fierce nocturnal predators. Leaping from branch to branch they perform some impressive aerial acrobatics to snag large grasshoppers, insects and any other living thing they can wrap their Gollum-like hands around and munch on. 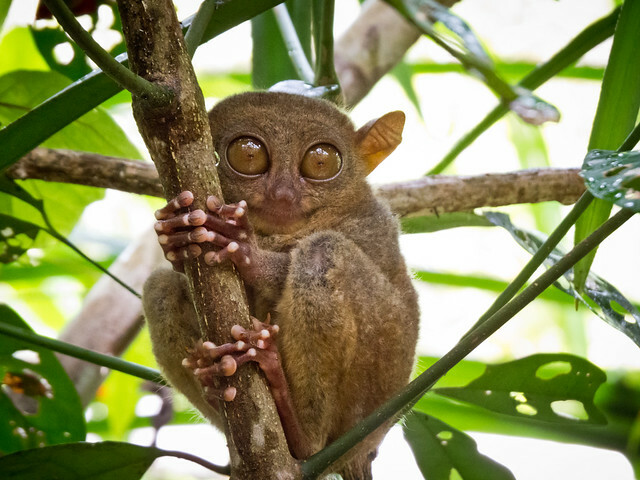 Interestingly enough, tarsiers are not just the smallest, they are also the only extant entirely carnivorous primates as well. Circling around the island we stopped at the popular beach spot of Anda, where we played in the surf with local kids and rode around the rocky jungle roads, spying on the local wildlife. We strolled up and down the beach collecting seashells and had incredible dinners overlooking the moving tide. 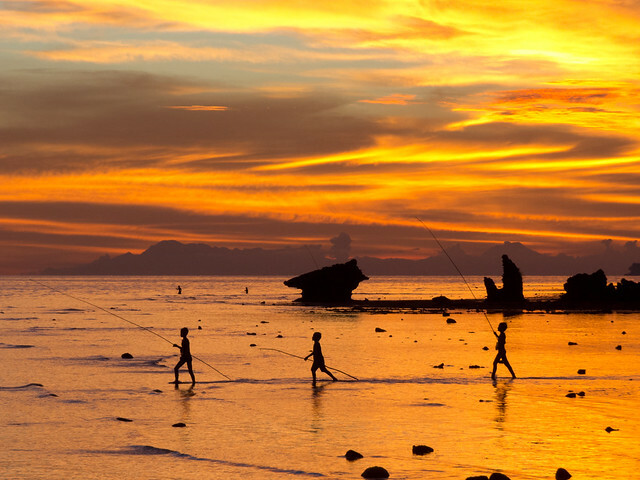 Bohol, thankfully not extremely touristic, was turning out to be exactly what we had hoped for. 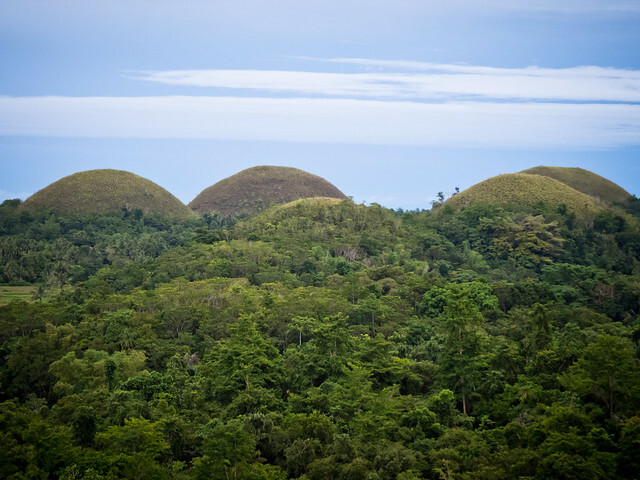 After Anda, we rode to view the Chocolate Hills, an odd, natural geological formation located just outside of Carmen. The main lookout spot had a pretty good view, but we much preferred spotting the thousands of scattered hills from the seat of our rented motorcycle. 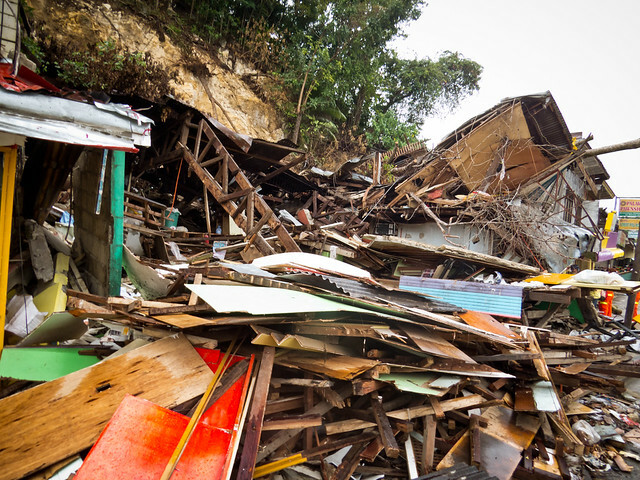 On the way back to Tagbilaran we drove through the handful of towns that had been hit hardest by the 7.2 magnitude earthquake just weeks prior to our visit. 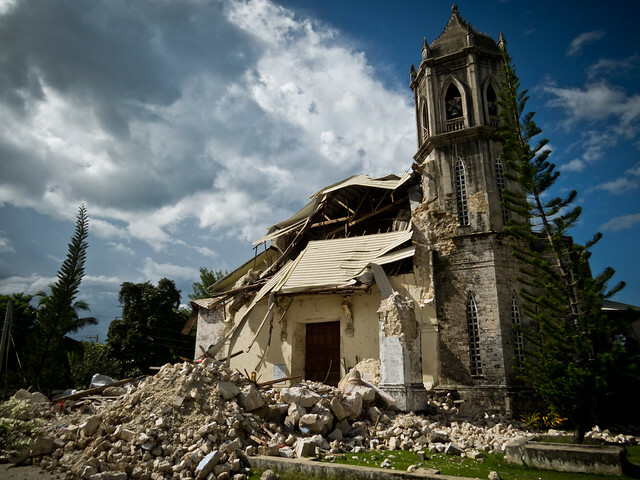 The damage heavily affected dozens of colonial-era churches, as well as hundreds, if not thousands of local peoples’ homes and businesses. Bridges were split in half, causing many of the fractured roads to suddenly end. Pipelines were splintered, causing water to flood many areas. 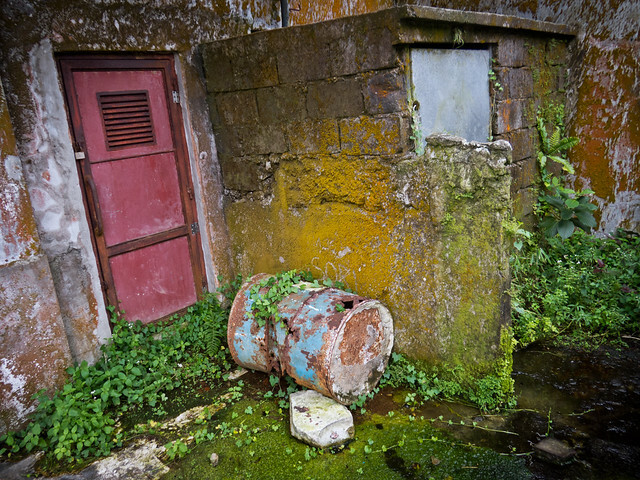 Scattered through muddy fields were encampments where the displaced locals retreated to. 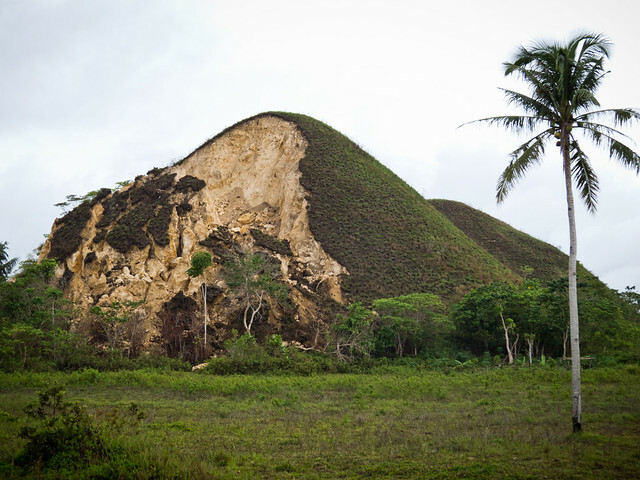 Even a few of the chocolate hills themselves had crumbled down from the powerful force of the earthquake. There are no words appropriate to describe how it feels to witness such damage and people struggling so hard to maintain a normal life. Of course, the earthquake wasn’t the only effects of natural disasters we experienced during our time in the Philippines. As we’ve previously documented our final week in the Philippines was spent in Coron as Typhoon Haiyan ravaged many of the islands, including our own. 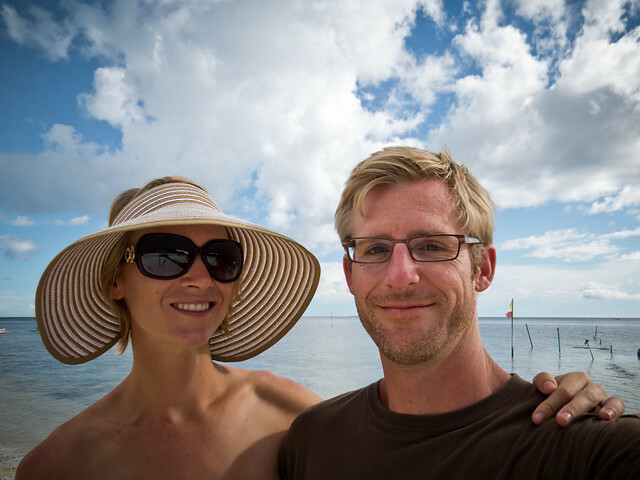 Our around-the world-adventure definitely went out with a bang thanks to that storm, but we survived and were fortunate to safely and happily spend the rest of our final few weeks of our big adventure in absolute bliss exploring these five Filipino islands. So, do we regret going to the Philippines during such a natural disaster-ravaged time? Not at all! 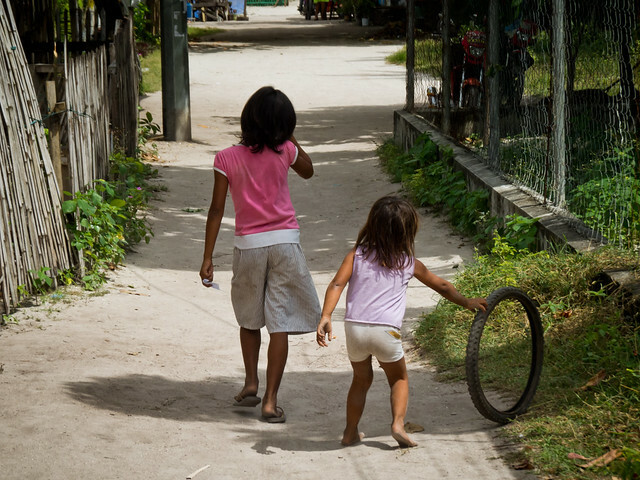 We’re happy that we could contribute even a small amount of tourist dollars to a variety of somewhat struggling economies. 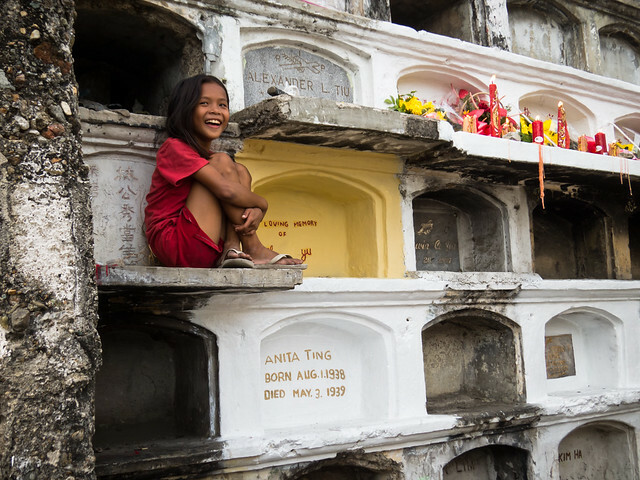 We witnessed the true grit and endurance of the locals after both the earthquake and typhoon. We dove some incredible waters. We enjoyed making new friends and seeing the pure joy in the faces of the children with whom we interacted. We’ll definitely go back… but we’ll sure try avoid typhoon season next time!